Street art during the Post Modern Era really got popular and it gave artists a way to spread their art to public viewers very easily. A lot of the art is not the typical fine arts, but it has purpose behind each piece that the artist wants to spread to all of the viewers. 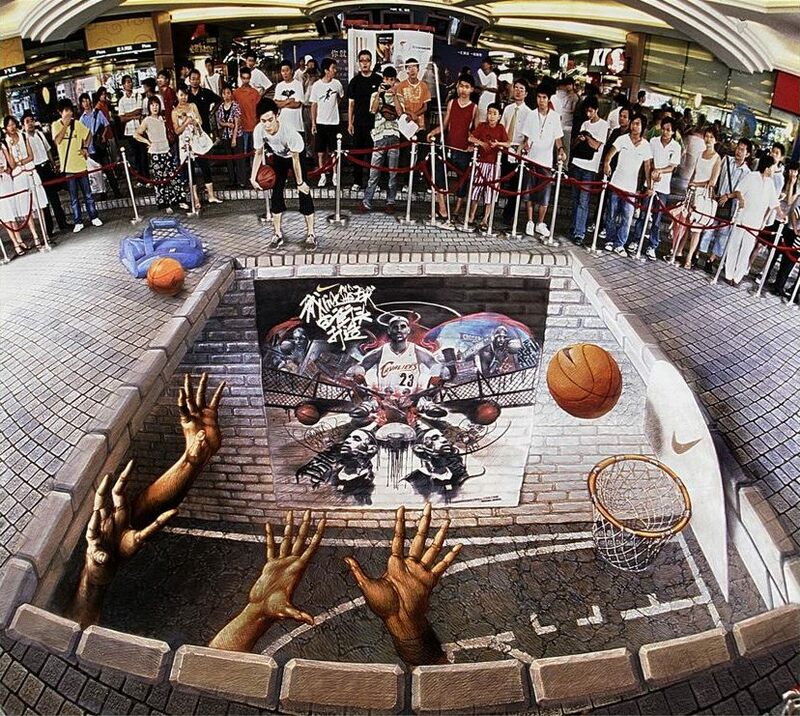 Some of the biggest street artists are Kurt Wenner and Jean Michel Basquiat. This piece of art by Kurt Wenner was done as an ad for Dunkin Donuts. There are many components to this piece, including fruits, flowers, and the main attraction in the middle. He does an excellent job making it look realistic, and the colors go together very nicely. This piece was done in Shanghai China for a Nike Commercial. I find it very cool because it brings a very American athlete to another country through an ad, and you can see the viewers are all amazed. The artwork matches to sidewalk very well, he made the brick line up and created an amazing backdrop for the painted poster. Once again this piece of art shows how diverse it really is. Kurt Wenner worked with the Honda Formula 1 team to show off their car in Jakarta. I am shocked at how well it turned out, and how the proportions all look correct. I do not have a real favorite from any of his galleries I find them all very good in different ways. He can take his talent all over the world, and it is recognized by the biggest companies in the world to advertise their product. That is a huge change from the beginning of street art when many people looked at it as not real art. 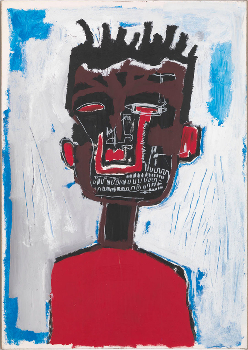 Jean-Michel Basquiat had a short lived career (life) but he made a large impact while he was working. He lived between 1960-1988 in Brooklyn, New York and dies of a drug overdose. (Jean-Michel). He really emphasized the racial split between White’s and African American’s. His work is so different from Kurt Wenner’s that I though it would should how contrasting the street art really was during the same time periods. In the early 1980’s Basquiat was convinced to start putting his street art onto other mediums, such as canvas. The chosen pieces are on canvas and not the streets, but they are excellent examples of his style of work. This piece of art named Pez Dispenser reminds me of a toy candy machine, that in this picture is painted with dark colors, and looks dead. I find this very intriguing because he did not make it pretty in any way, and I am not sure what exactly he is trying to portray. It can be taken so many ways and I wonder if he painted the dinosaur black for a reason? There are a lot of unanswered questions with this one. 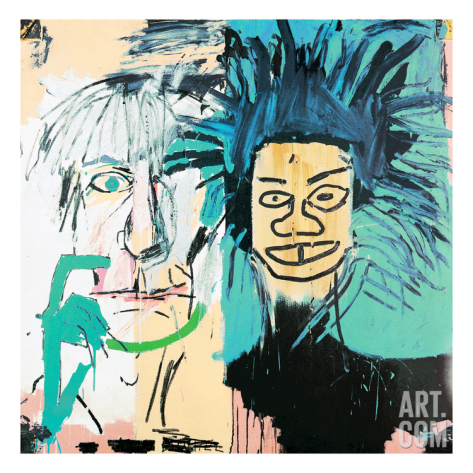 This is a piece that Basquiat made, and titled Self Portrait. It is not a very nice piece, and it shows a strange mouth. He died of a drug overdose and I wonder if he also had some self image and depression issues as well. His whole portrait has strange traits such as a black throat with a brown body. I think there is a lot to be said about this image and his view of himself. I like this piece, but it seems quite depressing (Exhibitions). This piece seems to depict a dirty, grungy person on the left, and maybe an eccentric person on the right. He is showing two very different people in one piece. He may be showing the split in New York, but I do not understand why the title is in Spanish. This piece also leaves many unanswered. I think it is important to see who different the street art can be. Kurt Wenner was hired to create beautiful pieces of art- often commercials. In his form the viewer needs to know exactly what he or she is looking at. He going into each piece with a plan and it is perfectly executed. The art that Basquiat creates is very open ended. There is a lot left to answer and it really makes the viewers think about what they have seen. Even with this new style of street art, there can be so many different forms of it in the same location. I like all of these pieces and I think that they will be enjoyed by a broad range of people. It can be easy to dismiss street art as real art so its nice to see you drawing attention to it. The 3D pavement art is definitely a great example of street art that really takes a lot of talent into order to pull off. The art by Basquiat was new for me though and it was interesting reading your interpretation of the pieces you selected and trying to see what my own were. The T-Rex one made me wonder the most about what the meaning behind it was. I was more attracted to the crown over the dinosaur’s head since it seemed out of place, but then thought that maybe it was over its head because of the dino’s name (Rex means king in Latin). 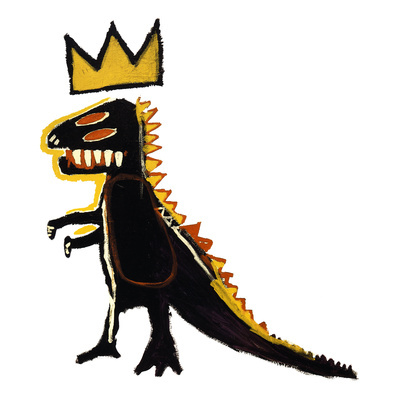 However, after looking up some more Basquait art, I noticed that the crown is a common feature in his art. I found out that the artist treated it like a signature or sorts, like it represented himself somehow. Maybe the T-Rex was his favorite dinosaur and he put his own impression on it in this piece. As for “Pez-Despenser”, maybe it was his favorite candy. Maybe the piece represents his childhood since kids like candy and dinosaurs. The dinosaur was drawn similarly to the way a child would, so its possible that that could be a connection behind the work. Oddly enough, going off of what I said about the crown, why then would the crown be absent from the self-portrait? If the crown is his signature, why then is he not wearing one? It may go back to what you said about possible self-image and depression issues that he may have had. Sure, with other subjects involved he’s more comfortable putting a crown in there like he’s proud of it, but he couldn’t bring himself to put one in his own self portrait. Why is he not a king when its his own portrait? Is he not proud of it in someway? The last one definitely shows a racial divide which I’m sure was not uncommon in New York at that time but, as you mentioned, the title is in Spanish. It could just be expanding on the whole idea of racial diversity (although I’m not sure if there was much Hispanic influence in New York at the time). Or maybe the artist like the way it sounded; difficult to say. Anyway, thanks for the post, was an interesting read.